We are only 3 minutes from Lake Texoma! Another great thing about us – unlike some dealers – is that here at Wild Bill’s Boats, you can always drive the boat of your dreams once financing is approved! We offer a great selection of new Xpress boats and Veranda pontoons, Alweld Boats, Gator Tail and Yamaha Motors for sale plus really nice, very clean pre-owned boats for sale including pontoons, and fishing boats such as center consoles, bay boats, ski boats, wakeboards, bass boats, bowriders, jon boats and others. Don’t forget to check out our custom bowfishing racks and aluminum fabrication. Whether you want to invest a lot, or modestly, we offer the best prices for ALL our customers’ boating needs. We even offer boat parts financing and have a new service department! Located in Mead, OK, Wild Bill’s Boats serves Ardmore, Durant, Lake Texoma and southern Oklahoma as well as Houston, Dallas, Sherman, Gainesville, Denison, TX and other areas of Texas. And we’re always happy to welcome our neighbors from Kansas, Missouri, Arkansas, Louisiana, and we offer international sales to Canada, Mexico, South America, Europe and Asia. 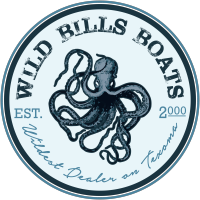 Stop in today and see for yourself why Wild Bill’s Boats is the wildest dealer on Texoma!